What Cancers Can Be Related with Nose Bleeds? Epistaxis or nosebleed affects most people at some point in their lives. Most nose bleeds originate from either the frontal or anterior nasal cavity while 5 - 10 percent start in the posterior nasal cavity towards the back of the upper throat. In most cases, the bleeding stops on its own and does not require medical care. For this reason, epistaxis in general is a minor health concern. But unexplained or recurrent nosebleeds can signify an underlying problem. But, is there a connection between nose bleeds and cancer? Recurrent nose bleeding may be a symptom of a cancerous growth within the nasal cavity or sinuses (paranasal sinuses). The most common type of such a cancer is known as squamous cell carcinoma (SCC) which occurs in the tissue lining the nose or sinuses. Some nasal and sinus cancers start in the bones, cartilage or other connective tissues. A rare cause of these cancers is melanoma which accounts for under one percent of the cases. Most cases of nosebleeds occurring as a result of nasal or sinus cancers are recurring and involve only one side of the nose. Such bleeding is usually light. Additional symptoms include single-sided nasal stuffiness and a runny nose, pressure in the ear, facial pain and tooth pain. Leukemia or cancer of the blood arising in the bone marrow may also be associated with nose bleeds and cancer. In leukemia, cancerous blood cells are produced in disproportionately higher amounts than the others which leads to reduced amounts of platelets. Most people with leukemia bleed or bruise easily. They may also get frequent nosebleeds. The most common types of adult leukemia are chronic lymphocytic leukemia (CLL) and acute myeloid leukemia (AML). These typically occur in older adults. Nosebleeds resulting from leukemia may be hard to stop. However, the bleeding is usually light. Besides nosebleeds and bruising easily, other possible leukemia symptoms include night sweats, fevers, swollen lymph nodes, bone pain, unintended weight loss, weakness and fatigue. Lymphoma is the name of cancer affecting the cells of the lymph system known as lymphocytes. These cells are found in the lymph nodes, tonsils, the spleen, the adenoids, the thymus and throughout the network of lymphatic vessels and tissues in the body. There are two main types of lymphoma: Hodgkin disease, and non-Hodgkin lymphoma (NHL). Because there are lymph nodes and lymphatic tissues throughout the body, lymphomas can occur in any part of the body including the nose. Lymphomas of the nose and its surroundings are typically NHL type. These may affect nearby blood vessels which may cause nosebleeds. When the bone marrow is affected by advanced Hodgkin disease or NHL that started elsewhere, bleeding resulting from reduced platelet production may occur. Symptoms of nasal and sinus lymphoma resemble those of other cancers affecting this region and may also be similar to those of leukemia. You should therefore not ignore the possibility of a link between your nose bleeds and cancer. It is noteworthy that these symptoms can also signify other conditions and illnesses like sinusitis. If you experience some of these symptoms due to other conditions apart from throat cancer, be on the lookout for any deviations from the norm. Watch out specifically for increased duration of occurrence and/ or severity and consult a doctor as appropriate. Liver cancer or hepatocellular carcinoma is among the most common cancers in the world. It starts as a malignancy in liver cells and patients may not show any major symptoms during the early stages. However, when the condition is at stage 3 or 4, symptoms such as lack of appetite, weight loss, nausea, vomiting, pain in the abdomen, jaundice, weakness fatigue, whitish stools, and swelling in the abdomen may occur. Nose bleeds and cancer of the liver may occur when the condition reaches stage 4. 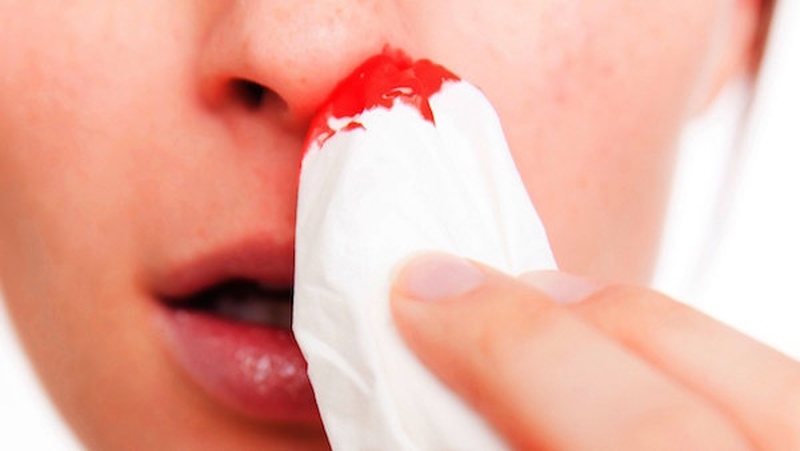 While only about 6 percent of nosebleeds need medical care, you should see a doctor in case of any heavy nose bleeding that does not stop within 10 - 15 minutes of applying firm and gentle pressure. You should also consult a doctor in case you experience recurring nosebleeds. Cancer may be a less common cause of nosebleeds, however, do not ignore it as a possible cancer warning sign. Damage of the nasal membranes due to forceful blowing of the nose or picking the nose. This is more common in case the nose has an irritation caused by a bacterial or viral infection, or common cold. Nose bleeds may recur. Breakdown or irritation of nasal membranes due to dryness. Such nose bleeds are more common when the air is drier especially during the winter months. People with blood clotting or bruising problems. If you bruise or bleed easily, consult your doctor for evaluation. Sit up in a chair or bed, to avoid choking or coughing in case blood is flowing down the back of the throat. Pinch your nose using the thumb and index finger and hold the pressure for about 10 minutes. Hold your head straight up and slightly tilt it back if possible. If the bleeding occurs in the front of the nose, put a ball of moist cotton in the nostril and leave it in for some time to ensure that you do not dislodge a blood clot that forms and stops the bleeding. In case a nosebleed does not stop within 15 to 20 minutes, seek medical care as soon as possible. This is even more important in case your blood is low on platelets or you have a blood clotting disorder. In case you bruise or bleed easily, consult a health care professional. In case of pain, you may take Tylenol, but consult your doctor or pharmacist before taking the medications. Avoid non-steroidal anti-inflammatory drugs (NSAIDs) and aspirin if you suffer from any bleeding disorder as they may worsen the bleeding problems. Inform your doctor, and other healthcare providers about any medications that you are taking. This includes OTC drugs, vitamins and herbal remedies. Server responsed at: 04/23/2019 5:56 a.m.